When you stay at Heritage Inn La Mesa in La Mesa, you'll be in the suburbs, within a 15-minute drive of San Diego State University and Qualcomm Stadium. Featured amenities include a 24-hour front desk, multilingual staff, and laundry facilities. Free self parking is available onsite. 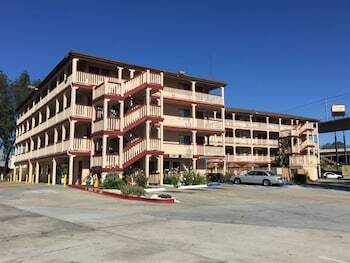 Located in Santee, Rodeway Inn Santee San Diego East is in the suburbs, within a 10-minute drive of Warbirds West Air Museum and Knox House Museum. Free self parking is available onsite.